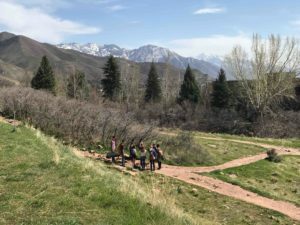 It was a place without a name, without any true purpose—an open, untended meadow along The Living Room trail, one of the most popular hikes in Salt Lake City. The meadow began at the trailhead and transitioned into a rocky series of switchbacks and overlooks about a quarter mile up the trail. 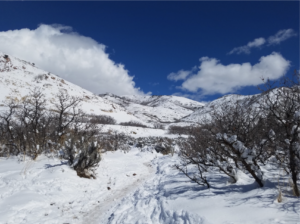 I usually stayed down by the trailhead and wandered off-trail, among the grasses and the scrub oak. I spent hours there watching the birds, and the sky, and, above all, the plants. My favorite was the Russian olive. It was the perfect tree to climb on, with its sideways branches. In summer it formed a secret grove with long, silvery green leaves that reached down to the soil like a weeping willow. As much as I loved that tree, however, I had to admit that it had its faults. Russian olive is native to Eurasia and was brought over by settlers in the 1800’s. Many consider it an invasive pest, or even a noxious weed, because it will crowd out native vegetation. But, even if it somehow disappeared, the meadow wouldn’t be pristine. 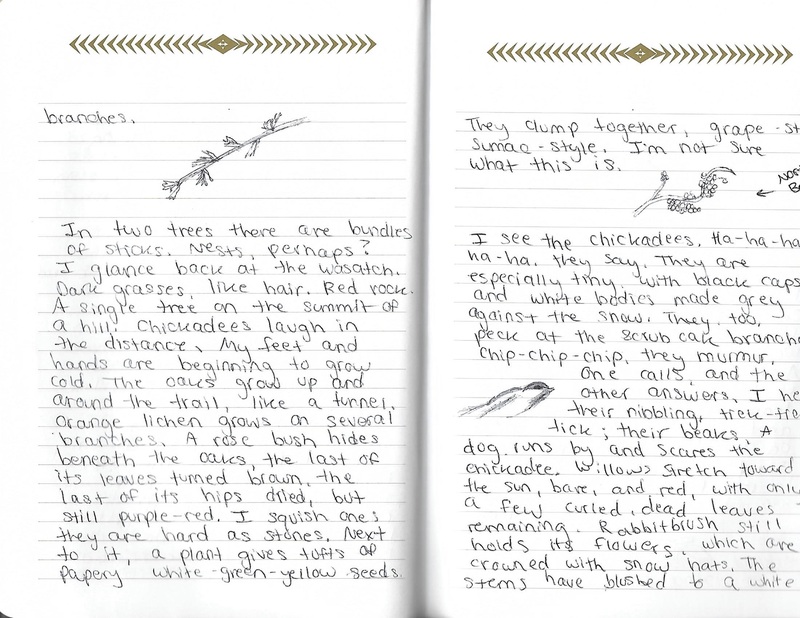 There were the other non-native plants, and the office building, and the dogs, and the trail, and the car noises. The trailhead was a disturbed area, after all. It wasn’t pristine or untouched. Few people would ever call it wilderness. But what is wilderness? Definitions of wilderness are transient—they shift depending on place, and person, and time. In his book Wilderness and the America Mind, Roderick Frazier Nash explores how western civilization’s perception of wilderness has changed from the bewildering “place of wild beasts” to the beloved, majestic wilderness image we know today. Nash argues that specific definitions of wilderness change depending on circumstance. He looks to the etymology of the word for an underlying definition. He writes that “in large part the root [of the word] seems to have been ‘will’ with a descriptive meaning of self-willed, willful, or uncontrollable.” So perhaps wilderness is, at its core, that which we do not control. Today, human influence reaches absolutely everywhere. Every ecosystem on Earth has been altered by climate change. Even the bleak, otherworldly center of Antarctica bears our mark. Our industrial economy has left its mark in other ways, too. Nuclear waste pollutes our deserts. Plastic pollutes our oceans. Satellites pollute the outer shield of the Earth. Nowhere on or around Earth has been left untouched by humans. Does this mean that wilderness no longer exists? Maybe. Maybe not. The U.S. government has strict qualifications for what counts as wilderness. Wilderness areas must be primitive, roadless, and undeveloped. Or, more specifically, according to the Wilderness Act of 1964, wilderness must be “an area where the earth and its community are untrammeled by man, where man himself is a visitor who does not remain;” a place created by nature, wherein “the imprint of man’s work is substantially unnoticeable.” Wilderness is a place unmodified by humans. You can’t build in a wilderness area. You can’t enter the wilderness with more than twelve people in your group, and you can’t stay in any one place longer than two weeks. Utah is home to 33 designated wilderness areas, all of which are protected by law. But there are many more areas in Utah that might be thought of as wilderness, even though they don’t legally qualify. There are other troubles with wilderness. As William Cronon points out in “The Trouble with Wilderness,” even before the arrival of Europeans and their widespread development schemes, most ecosystems had long been altered by humans. Europeans only perceived the New World as wilderness because they didn’t count indigenous lifestyles as “civilized,” and because in many areas, European diseases preceded their settlements. Most of the places we’ve legally designated as wilderness are not pristine or untouched. Native peoples were forced from their homes in many National Parks—including Yosemite and Yellowstone—in order to craft artificially empty landscapes. Despite their at times unjust histories, our National Parks, Wildlife Refuges, and designated Wilderness Areas are immeasurably valuable. Not because they’re remnants of the pre-human or pre-European world, but because they’re places where more-than-human life flourishes. Bison rumble across the Yellowstone steppe. Grizzlies nuzzle salmon from Alaska’s McNeil River. Great towering redwoods hold fog-soaked worlds in their branches. Wilderness areas give non-humans the space and resources they need to remain healthy. In Ecosystem Health: Definitions, Assessment, and Case Studies, David Rapport states that ecosystems can remain healthy even when humans interact with them. They become unhealthy when humans take things too far—pollution, overharvesting of resources, the introduction of non-native species, and the impacts of climate change. It’s not that humans use resources; it’s that we use too much. Here in the United States, our current economic system requires constant growth, which has led to the unnecessary overuse of resources and the degradation of ecosystems—including urban ecosystems. What we’re missing is sentience different from our own. Our over-reliance on technology has blunted our senses and our attunement with what David Abram has coined the “more-than-human” world. We are completely enveloped in the human way-of-being, and our lives are mediated by our phones and computers. This, Abram argues, is why we’ve allowed environmental destruction. We’ve been so wrapped up in our own creations that we haven’t truly felt what’s been happening. And now, when we try to re-attune, it’s too painful, and we retreat again into human technology. It’s too painful to look outward and face what we’ve done. But we need to look if anything is going to change. Technology is not necessarily unnatural; it’s just very human, and sometimes suffocatingly so. According to Abram, “an area we can enter unmediated by human technologies” is one way to define wilderness. By that definition, wilderness could be so many places. A vacant lot, bright with dandelions. The everglades. 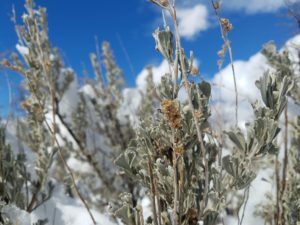 Or the open space along the trailhead, among the scrub oak and the willows and the great Russian olive tree, where the chickadees flicker through branches and where the snow falls in random pats off the trees. Cronon, William. “The Trouble with Wilderness.” Uncommon Ground. Shiplee, B, 2004. Abram, David. Lecture: “Magic and the Machine: Notes on Technology and Animism in an Era of Ecological Wipe-Out.”Awe and Attention Symposium. University of Utah. February 16, 2018. Nash, Roderick. Wilderness and the American Mind. New Haven, CT: Yale University Press, 1982. Peterson, J.S. “Plants Profile for Elaeagnus angustifolia (Russian olive).” Plants Database. July 15, 2001. plants.usda.gov.